2019 looks set to be all about colour and one colour in particular is going to make a big splash at weddings this year. 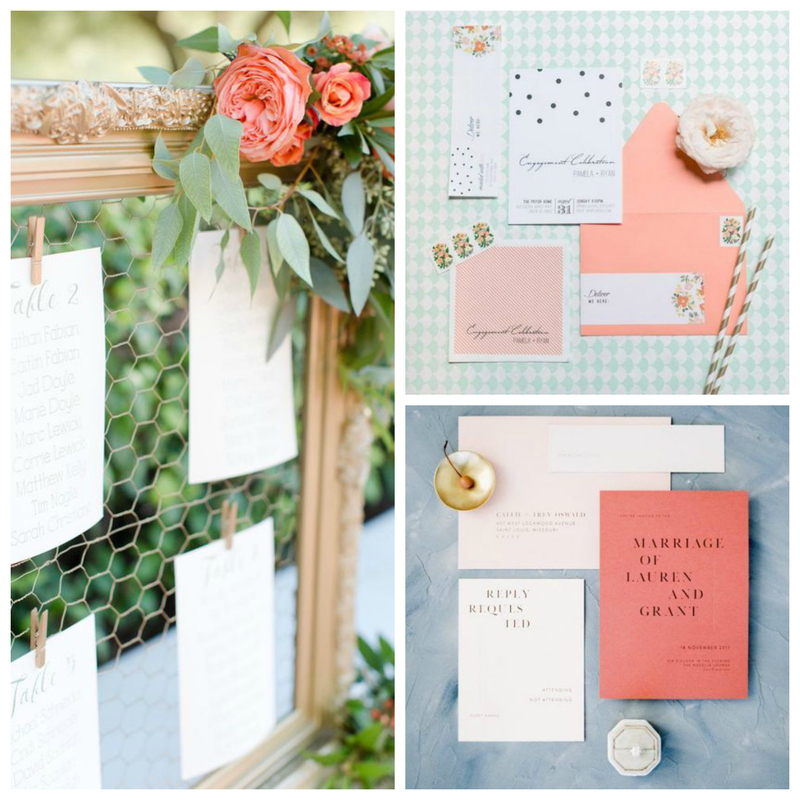 The experts at Pantone have announced that Living Coral is their favourite shade for the next twelve months and the announcement has made the wedding world very happy. Not only is coral already a popular choice for weddings but Living Coral is a bolder shade that’s perfect for adding bright pops of colour throughout your wedding day. 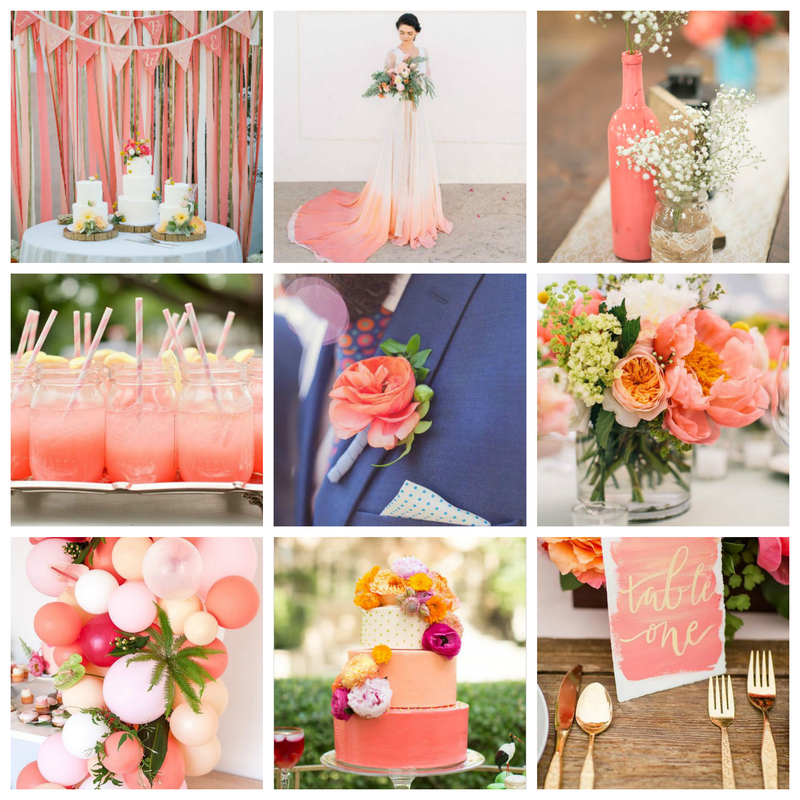 Here’s our guide to using Living Coral on your big day. 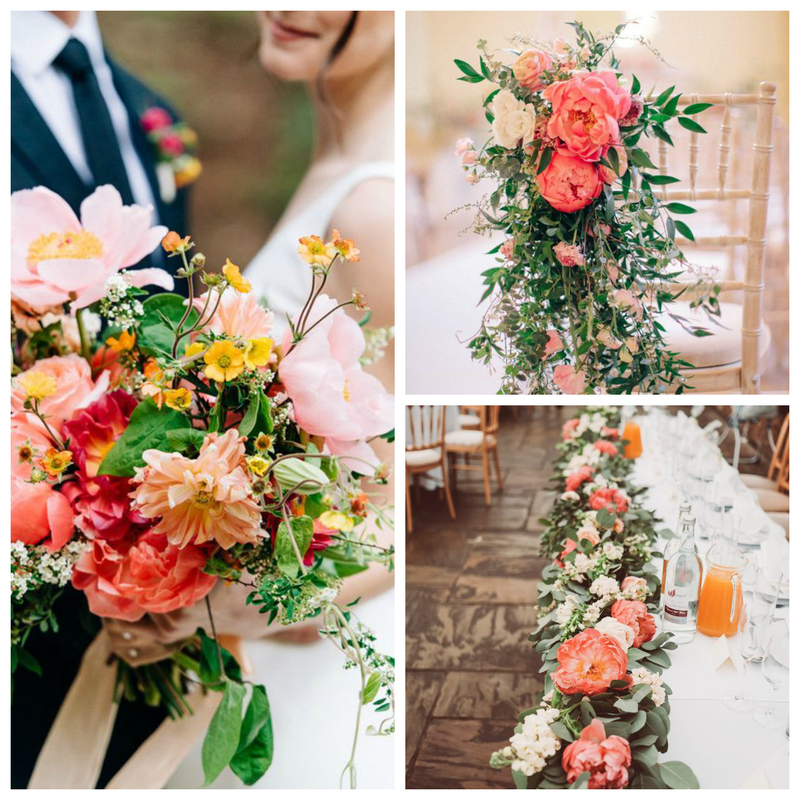 The first thing to say about Living Coral is that it works really well with lots of other colours so it’s great for weddings at any time of year. Use it with lots of greenery and neutral shades in spring and summer or navy in autumn and winter. Living Coral is great against greys and also with tropical shades in summer and autumnal colours as the seasons change. That said, Living Coral works best when it’s an accent colour rather than the dominant shade in the colour palette. So, where does Living Coral look best? Well, we love seeing pops of colour used in ways that you just can’t ignore. A few coral coloured blooms on a table plan will definitely attract the attention of guests, which is just what you want! Similarly, give you guests a hint of your colour choice by using Living Coral on your stationery – opt for a fun, modern design or something more classic if you prefer. It doesn’t matter because Living Coral works for all styles. One of our favourite ways to bring your wedding colour scheme to life is always you’re your bridesmaids. 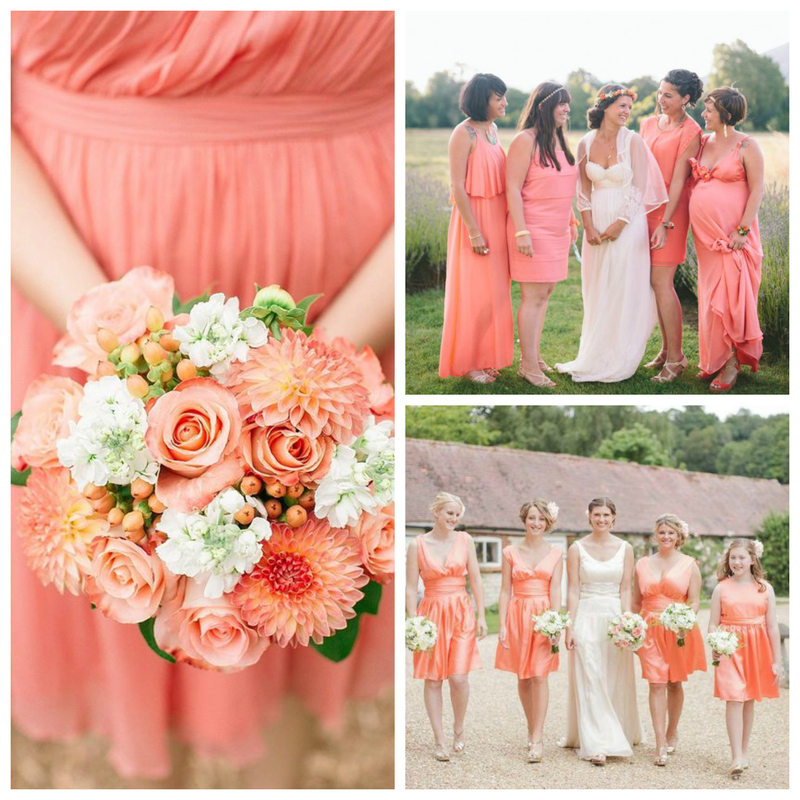 Choose a bridesmaid’s dress in Living Coral and then add more colour with their bouquets. It’s up to you whether you go for matching dresses or a more relaxed mix-and-match of styles – it’s the colour that’s the important thing! We absolutely have to talk about flowers because there’s no better way to bring colour to your wedding. Right now, we love wedding flowers that have a really natural style. It’s almost as if they haven’t been arranged at all and this ‘undone’ look is just perfect for woodland weddings. Speak to your florist to see what blooms will be available on your big day in Living Coral and then add lots of texture and contrast to arrangements and bouquets. If you’re on a budget, use just a couple of statement blooms with lots of greenery. When it comes to the details of the day, you can really go to town! Create your own ribbon backdrop to highlight your cake table with Living Coral and other coordinating colours or paint bottles and jars and use these to hold flowers or sprigs or gypsophilia. A dip-dyed dress is a cool choice for brides and buttonholes always add colour to your groom and groomsmen’s suits. Balloons are ideal for fun weddings and don’t forget coral coloured cakes and cocktails! Don’t forget that we’re holding our spring Open Days at all our woodlands on Sunday 19thMay and we’d love to see you. There’s a 10% discount on all wedding packages over £1000that are booked on the day. Of course, if you can’t wait until May, get in touch today to request a copy of our brochure or to arrange a visit soon.